Thanks! Always nice to get some feedback, especially good one! Add a router to your multi-tool and you've all you need to build great cases and other stuff made from wood. It's the cheapest and, in my opinion, most convenient way if you want to create something really new. I bougth my router including the cutting bits for around 35 €. It was cheaper than to rent one for 2 days. 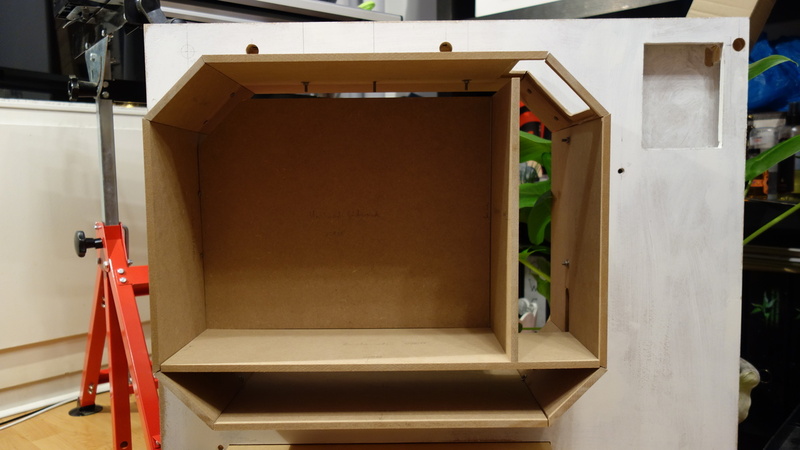 Next step was to assembly the inner case for the first time. Unfortunately the panels didn’t fit as planned. My mistake was to cut the panels before I finished the side panel. 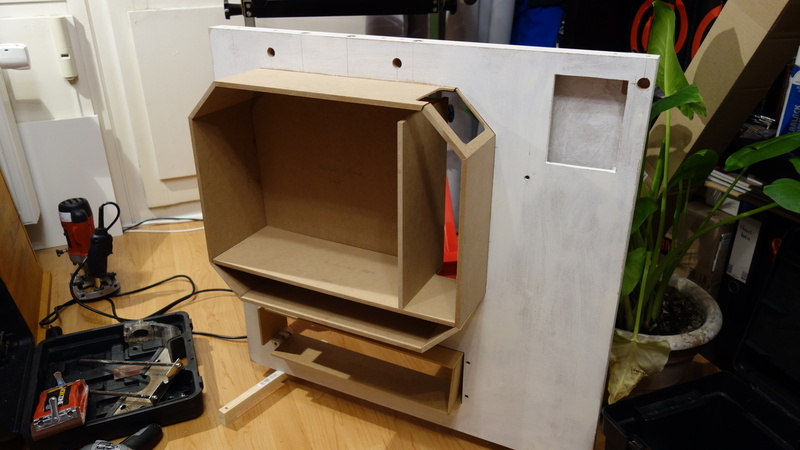 After all the sawing, filling and sanding the openings within the side panels just got a little bigger than planned. I’m going to fill the gaps with glue and filler. Not all panels are fixed at their exact position, so don’t mind the gaps. The section on the right is meant to be for the power supply. 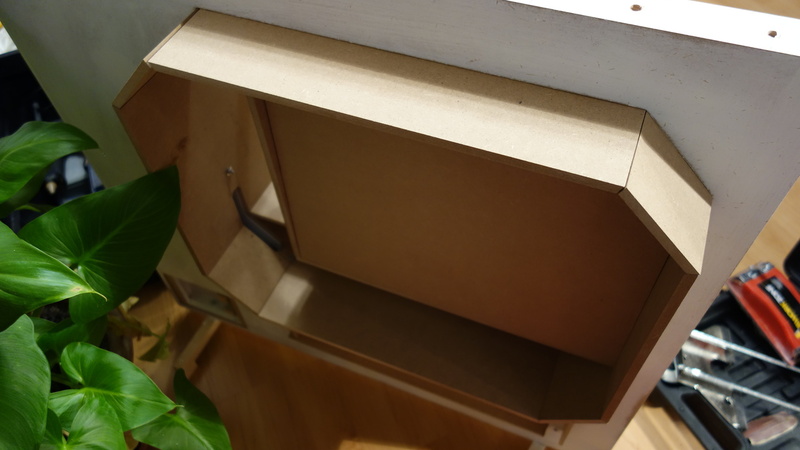 It will pull the air out of the main section and blow it up and out of the case. This is going to be the only active ventilation for the main section. At the back side there is enough room (6 cm) for all cables, the Aquaero and other supplies. 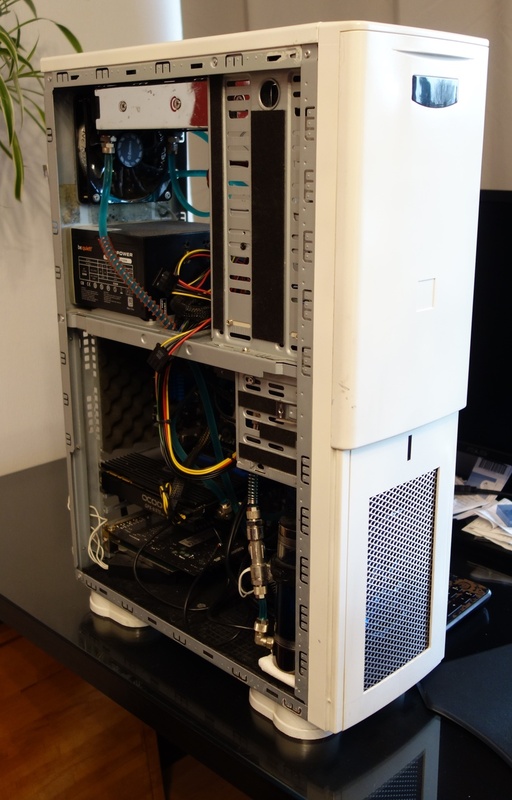 … and one to the back headed for radiator, multiple electrical outlet and monitor etc. Parallel to working on the case itself I did a lot of planning for the inner details. 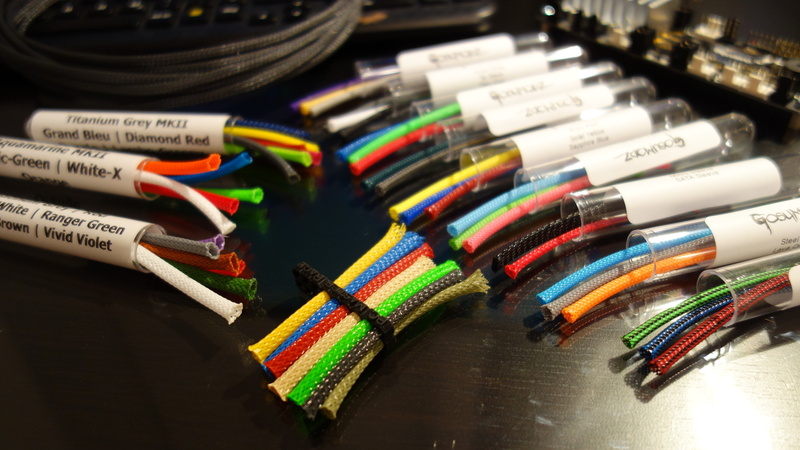 I ordered sample kits to compare the Paracord and the MDPC-X sleeve. The plan is to avoid all visible cables. But the few you will see have to look perfect! I thought about colored sleeve, but decided against it. I don’t know what color theme the next hardware generation is going to have, and do not want to have to do the sleeving again. 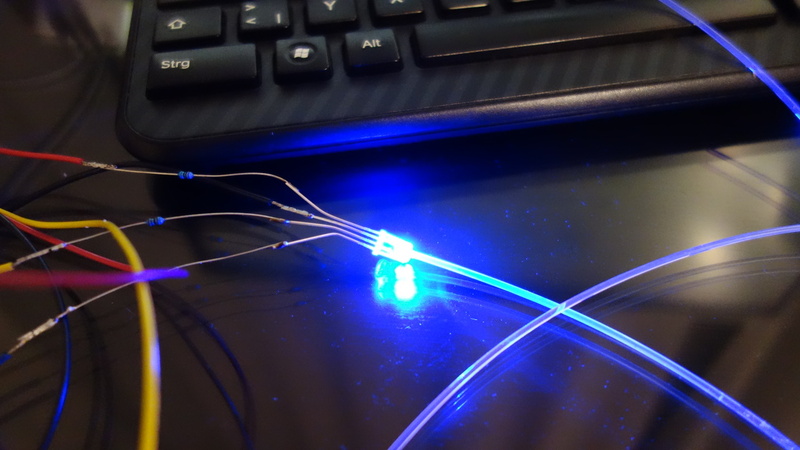 Then I got an idea for changing color accents in the cables according to the main lightning. First step of this idea was to use cable chains. They are a perfect choice to achieve the industrial look I am looking for. I am going to use the MDPC-X-sleeve in black and two shades of grey. 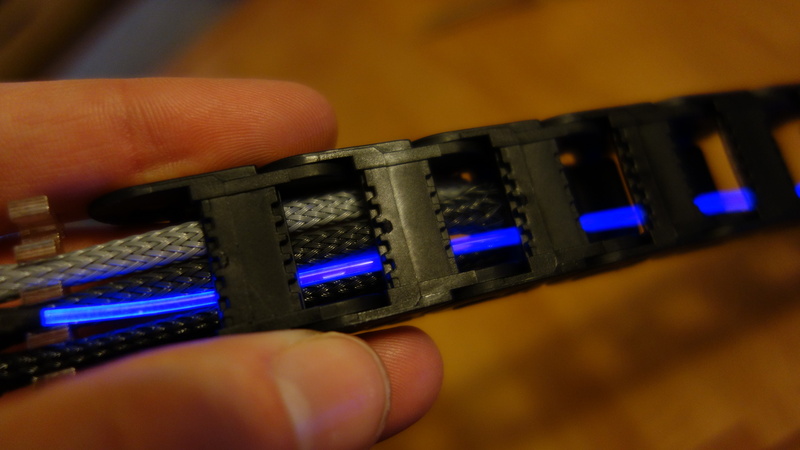 In addition to the sleeved cables I am going to put fibre optics into the cable chains. I found a special one with a diameter of 1.5 mm which emits light not only from end to end but also to the side. 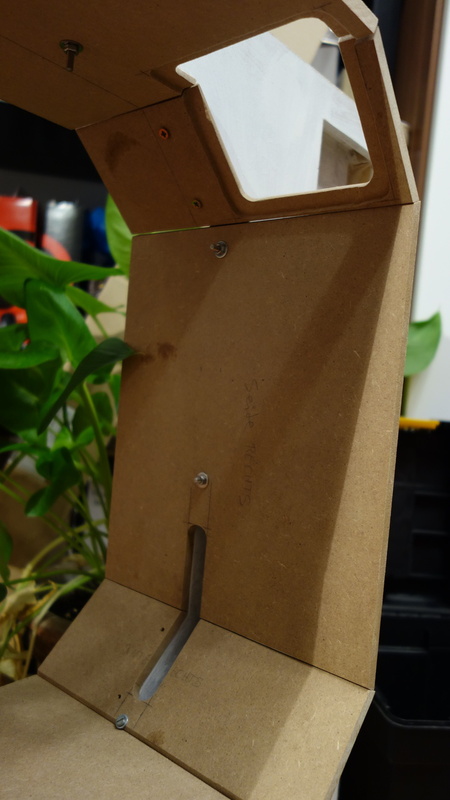 The light yield was a problem, till a forum user made the suggestion to cover the open ending with aluminium foil and shrinking tube. Now it’s bright enough. 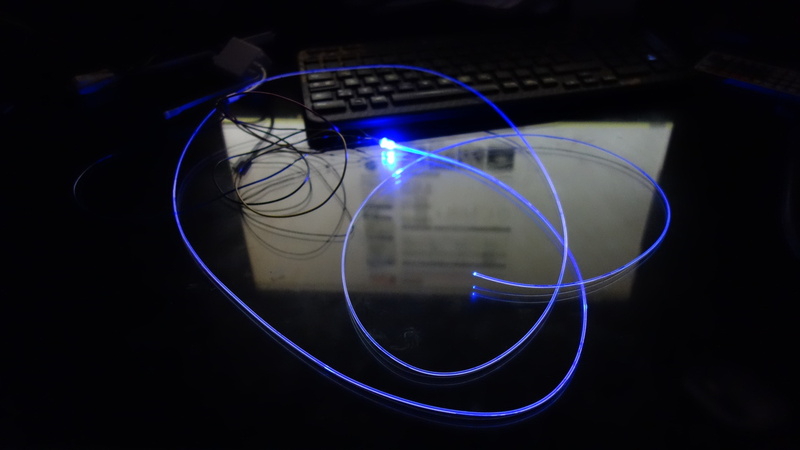 Since I am going to use more than 8 m of RGB-strings and several 5 mm LEDs, one Farbwerk is not enough. I ordered a second one. Awesome stuff! Serious creativity going on in here! I cleaned all cooling parts in an ultrasonic bath. I exchanged all sealing rings. All copper parts got a bath in citric acid. Took no pics of all the work. 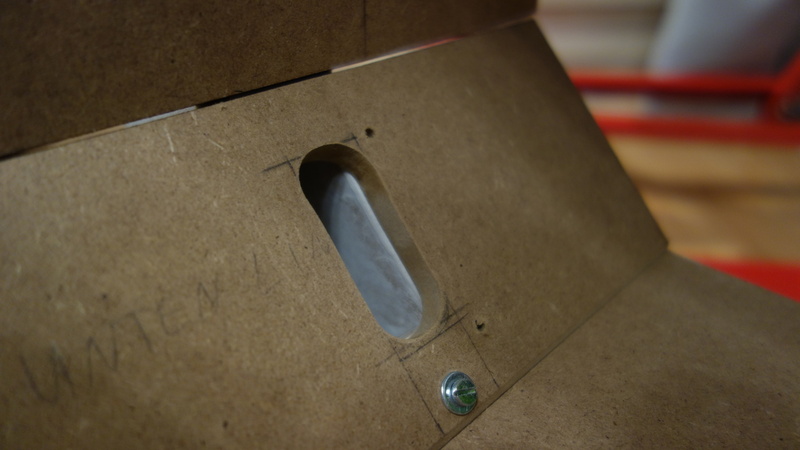 Then I drilled out the rivets of the backplate of an old case. 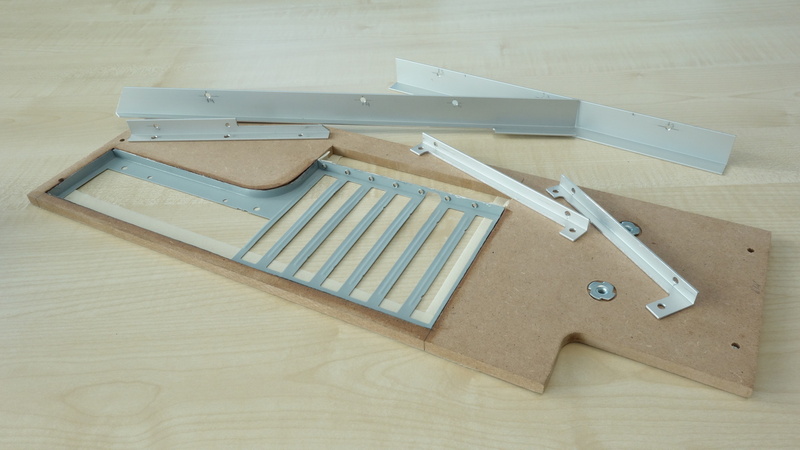 I am going to install this backplate into my MDF-backplate. By this I get a good fitting backplate with all the openings and fixing points it needs. You will not be able to see this backplate in the end, because I’m planning to use a cover. I mounted my motherboard and marked the position of the different connectors. 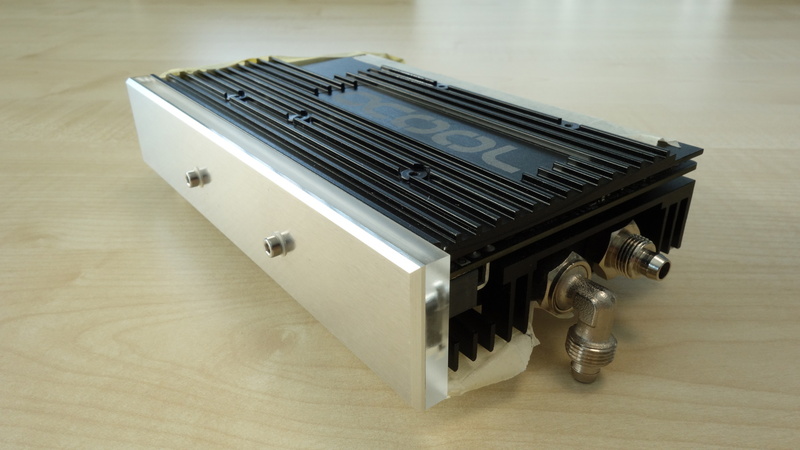 Till the project is finished I am going to use only the onboard GPU and the boxed cooler. 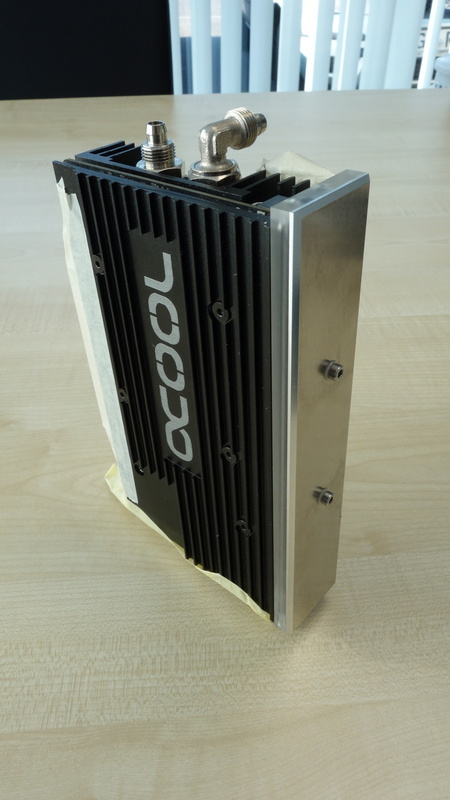 I have plans for the GPU-cooler. Another reason finish this project as fast as possible! 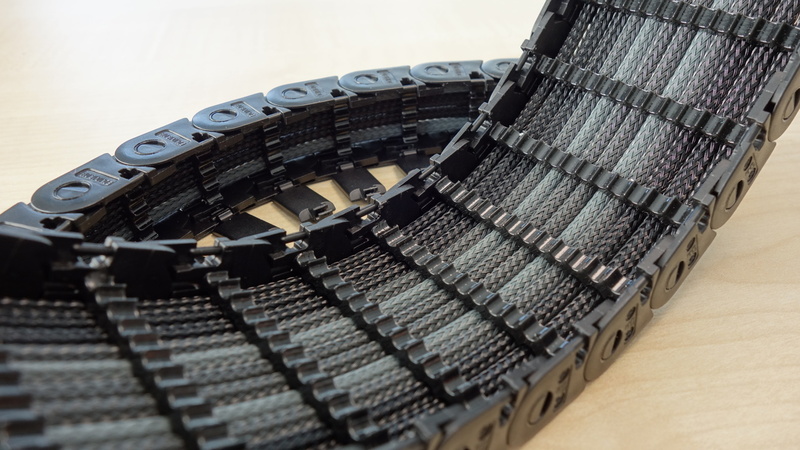 To get the perfect symmetry of the sleeved cables in the energy chains I need cable-combs. Especially to get the fibre-optics in the right positions. There are no matching ones on the market, so I had to develop my own ones. They are very delicate. I 3D-printed them on a Polyjet-3D-printer at work. 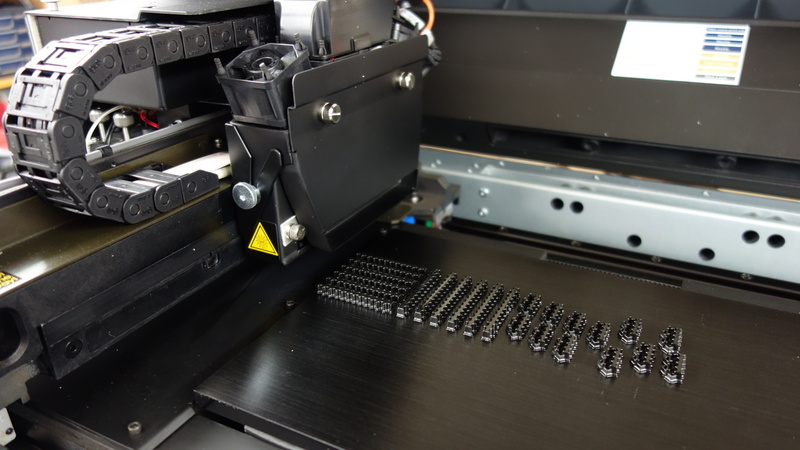 These printers are way more accurate than the common 3D-printers which meld a filament. 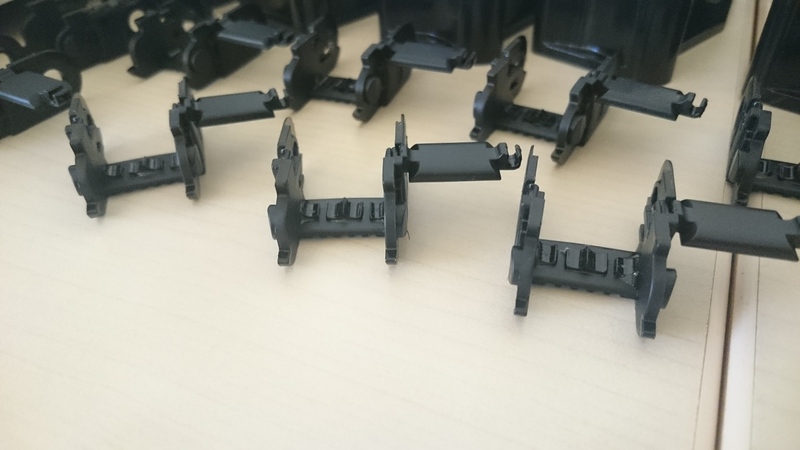 They print by applying a 16 um thin coating, which is hardened by UV-light. 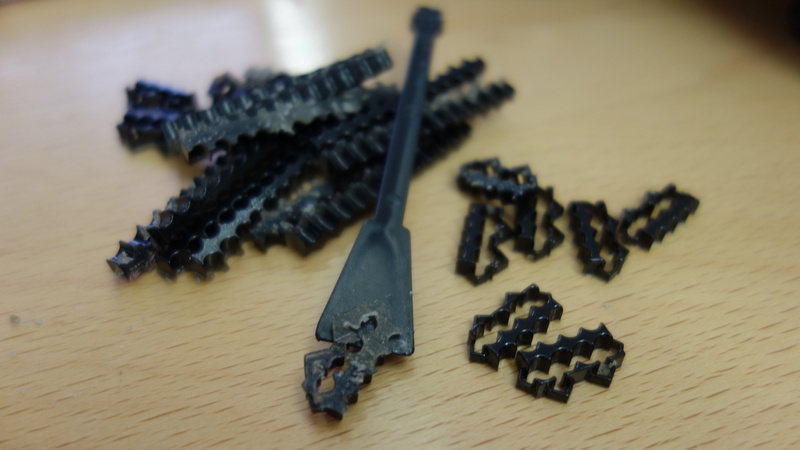 The smaller combs consists of several small pieces, connected through pins which I am going to remove after gluing. After printing them I had to remove some support material. Last remains are disintegrated in sodium hydroxide. Then I started milling some of my parts. 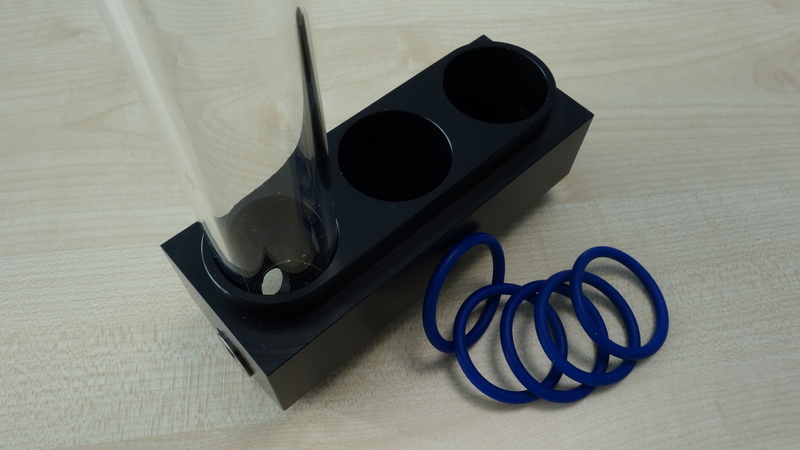 I am planning to build my own reservoir, using three tubes made of borosilicate glass. Found a glassblower who manufactured them for me. Most important part was to get rounded edges. My goal is to manufacture as many parts as possible on my own. Nevertheless, for the reservoir bottom part I needed the help of my chef and a CNC. 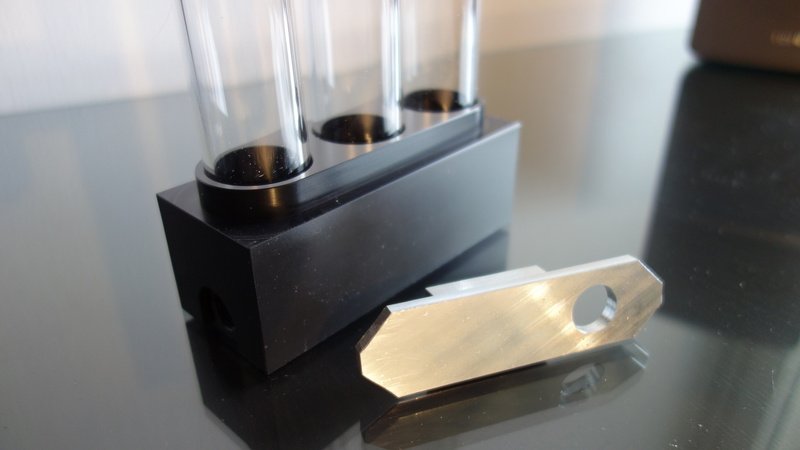 There is no way of milling the inner T-slots for the O-rings on a manual milling machine. 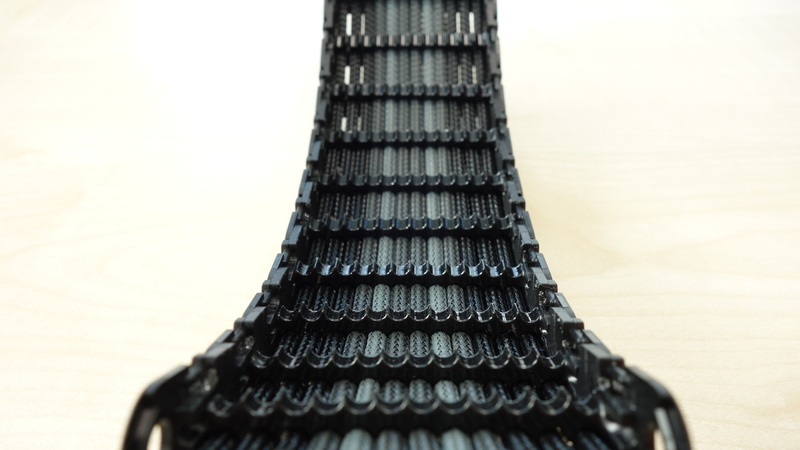 The material is POM (Delrin). 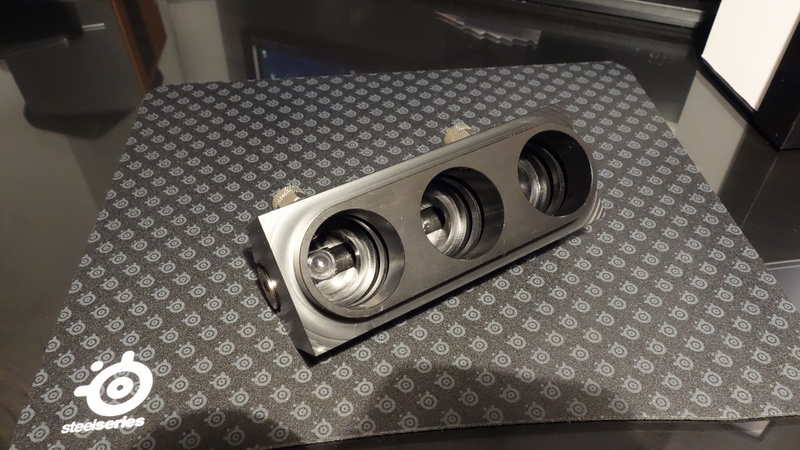 This piece isn’t finished yet, the G1/4“ threaded holes are missing. Later you will not be able to see this piece, I am using a cover made out of aluminium around the tubes. 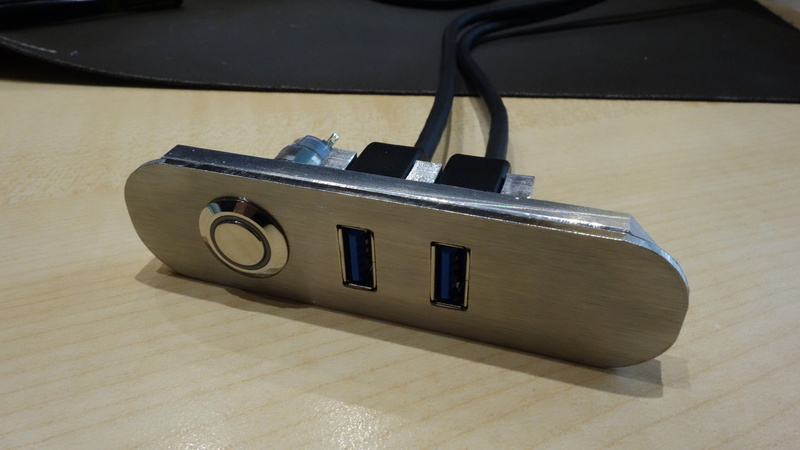 The aluminium piece is the basic block for the front panel, with openings for the power button and two USB3.0 connectors (not done yet). It will get a cover made from stainless steel. The reservoir bottom part is almost finished. 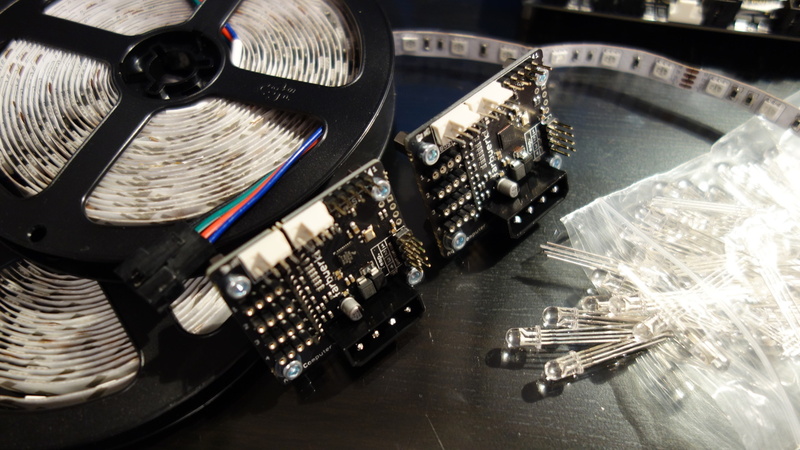 I only have to add some threads for attaching it to the case. 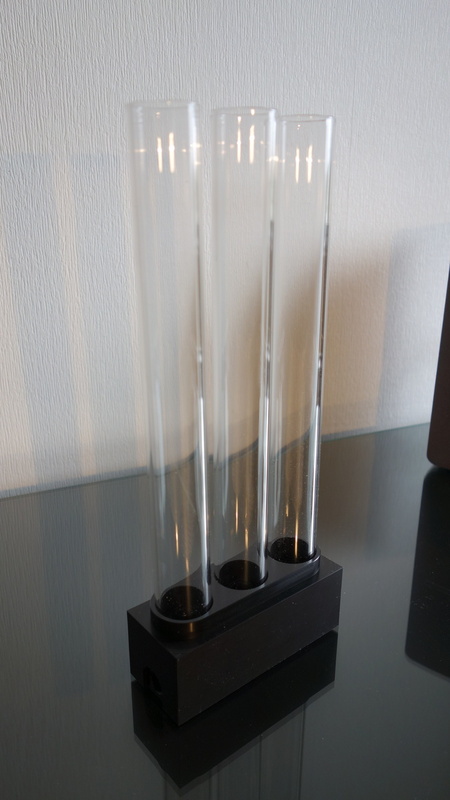 There is a holder for a RGB-LED exactly underneath every glass tube to enlighten them from underneath. Inlet and outlet are facing upwards at an angle of 45°. By this the incoming fluid is pressed into the tube instead of directly going to the outlet. I hope to get a better degassing through this. I’m not satisfied with the quality of the surface yet. I’ll have to sand it a little bit later. 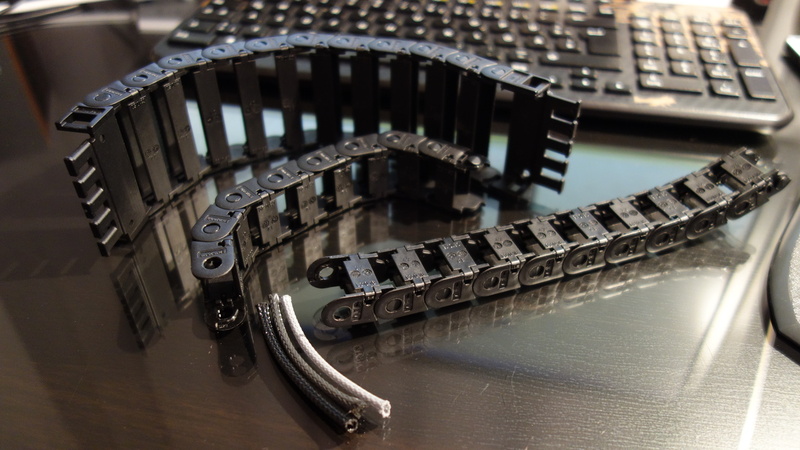 I then started with gluing in the 3D-printed cable-combs into the energy chains. Sleeve-color is just improvised. 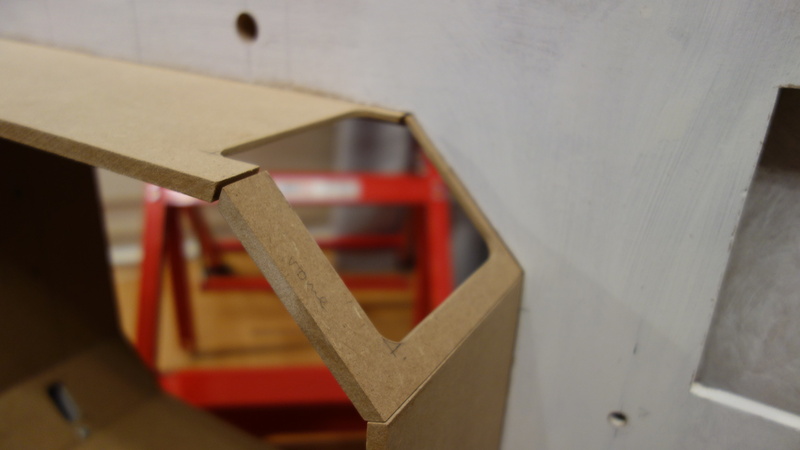 Then I worked on the front panel which will be located at the face side of the side panel. 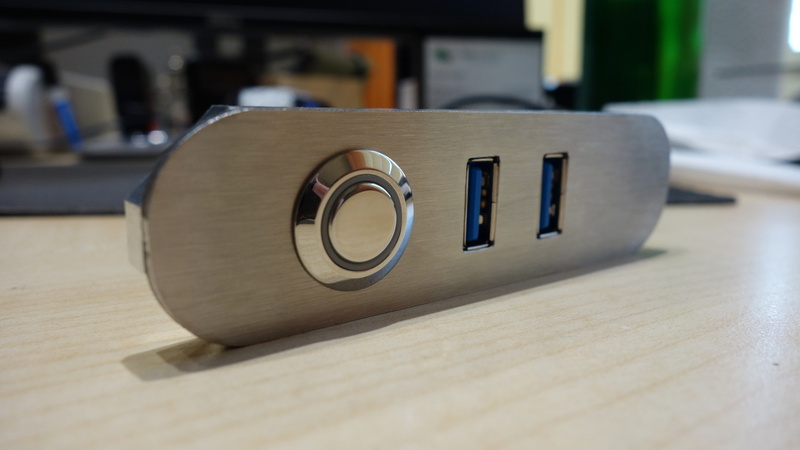 The back part is made from aluminium, the front cover is 2 mm thick stainless steel. Was a lot of work with the key file. I decided to go to a professional to get my visible cables sleeved. The german representation for MDPC-X is purple-banana.de, and they did an amazing job! I’m really happy about the results. 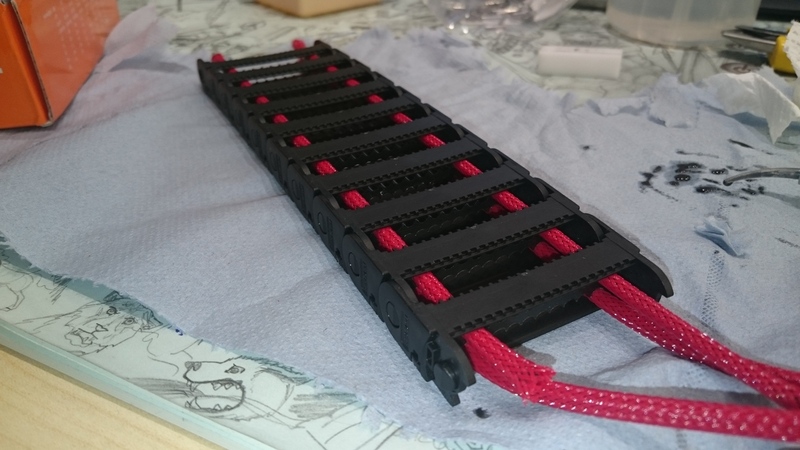 I ordered the cables unmounted, to be able to assemble them easily into my energy chains. The chains are not finished yet, but I could not resist to try out. 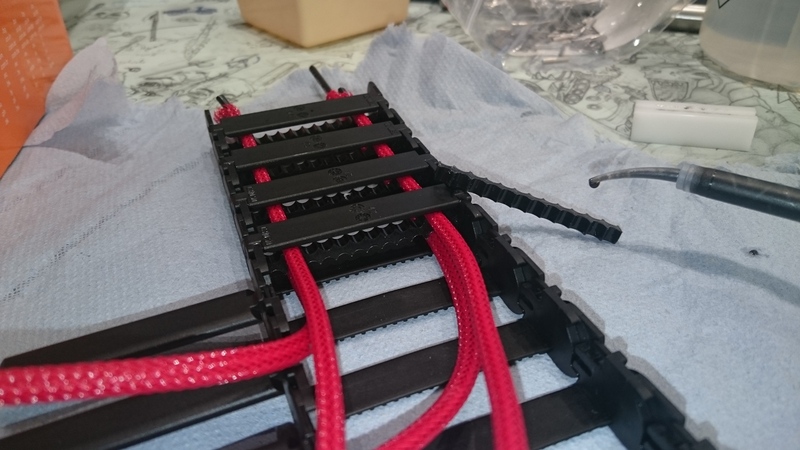 The Cable-Combs work very good, no catching of sleeve or anything like that. 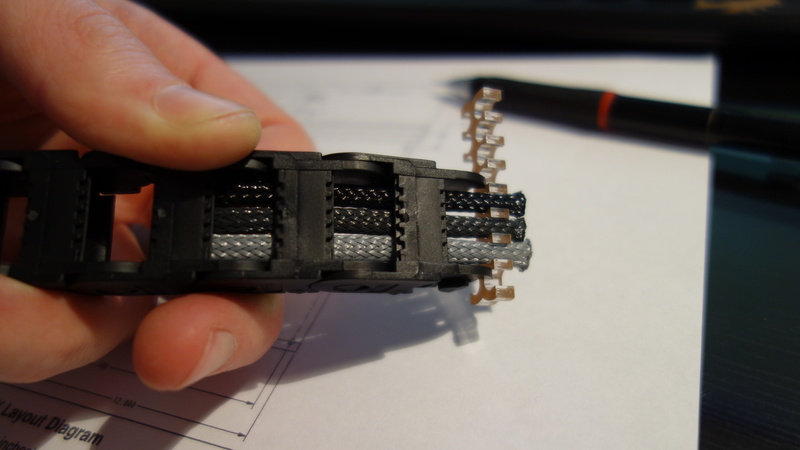 Don’t worry about the gap between the three cables at the outer sides, they’re needed to let room for the fibre optics. 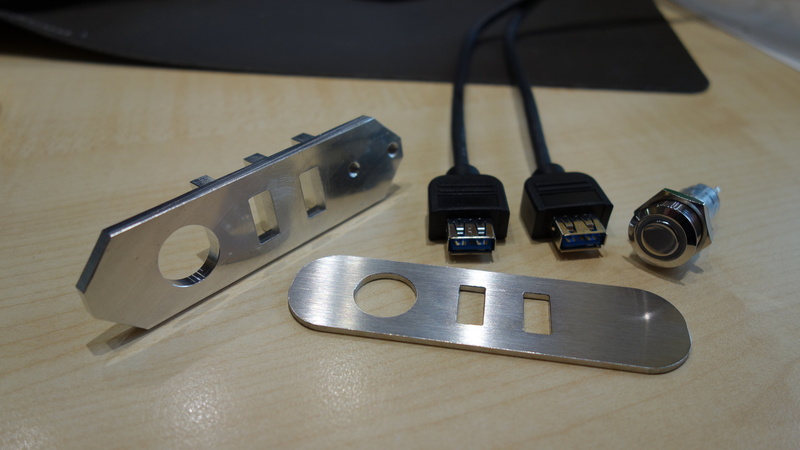 The sleeving of the USB3.0 was a problem. 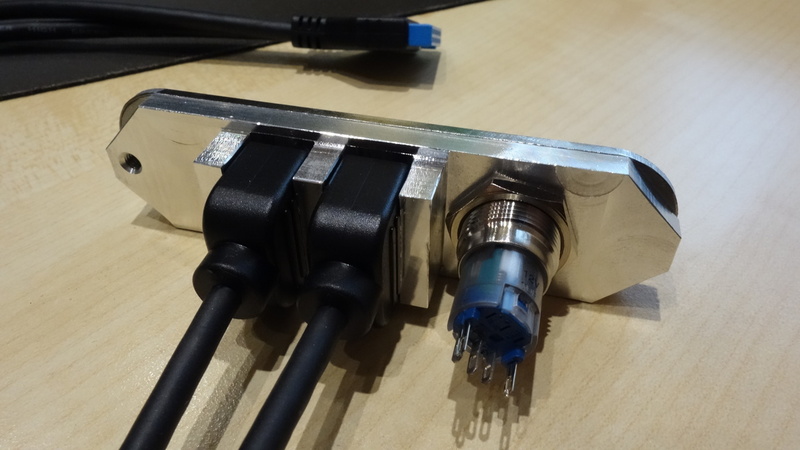 I did not want to cut up the cable, but the connectors are too big for any MDPC-X sleeve. Luckily, I had some old Phobya Sleeve lying around. 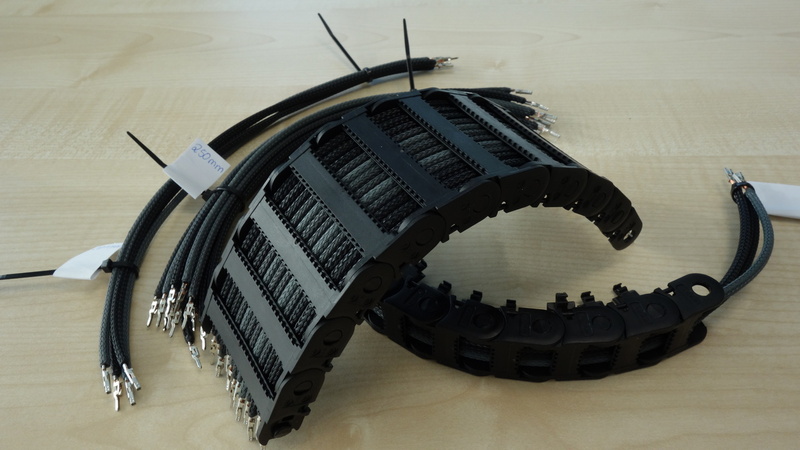 It has high stretching capabilities, and looks quite similar to the MDPC-X. 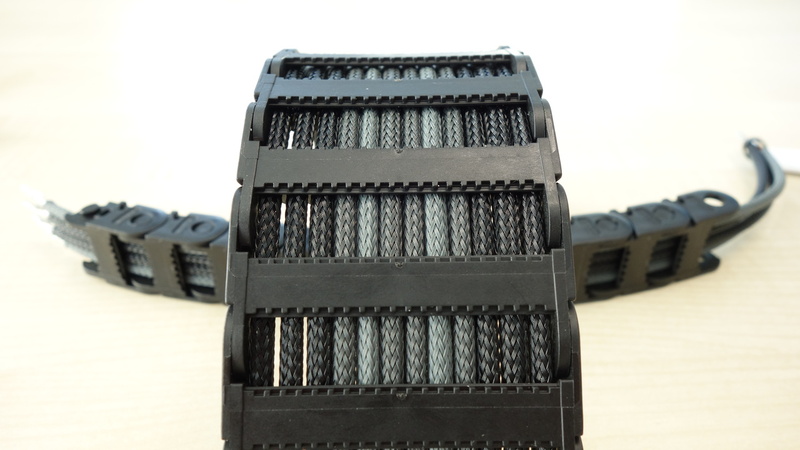 Main disadvantage is the coarse mesh, you can easily see through. 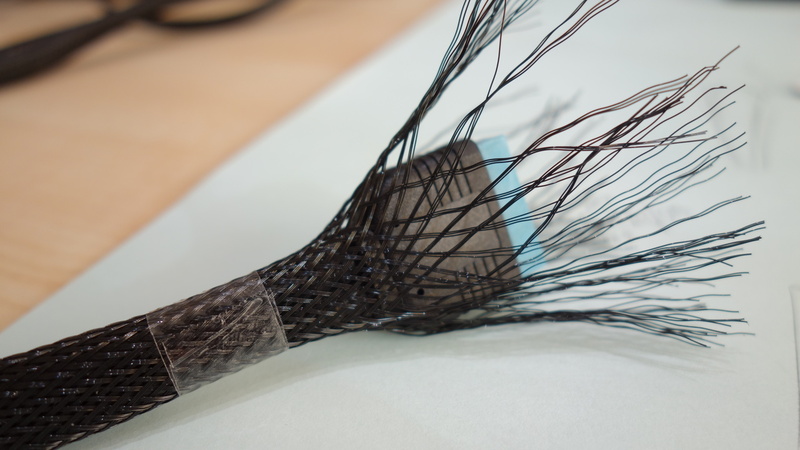 But since the cables are black this isn’t a big problem. 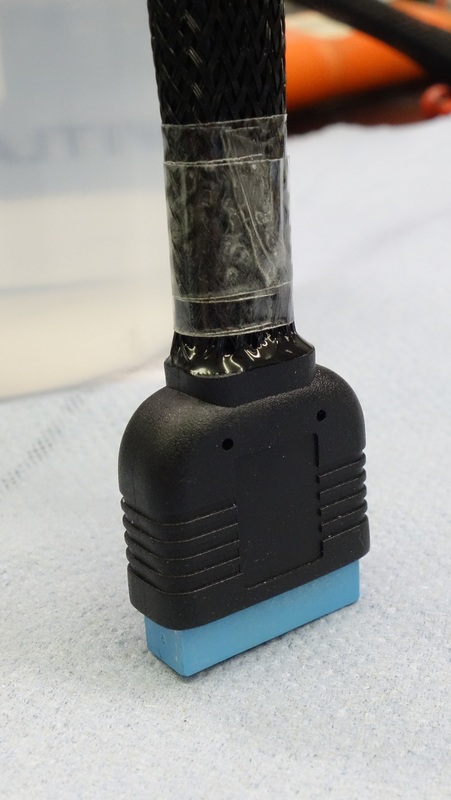 Without a chance to use any shrinking tube, I used 2k-glue to cast the end of the sleeve to the connector. I’m going to use two O-rings for each glass tube of the reservoir. The ones I bought first are made out of NBR with a hardness of 70 Shore-A. This is too much for my glass tubes, I can’t press them in. And I am too afraid of breaking them. So I bought softer O-rings with 50 Shore-A, and now it fits really good. 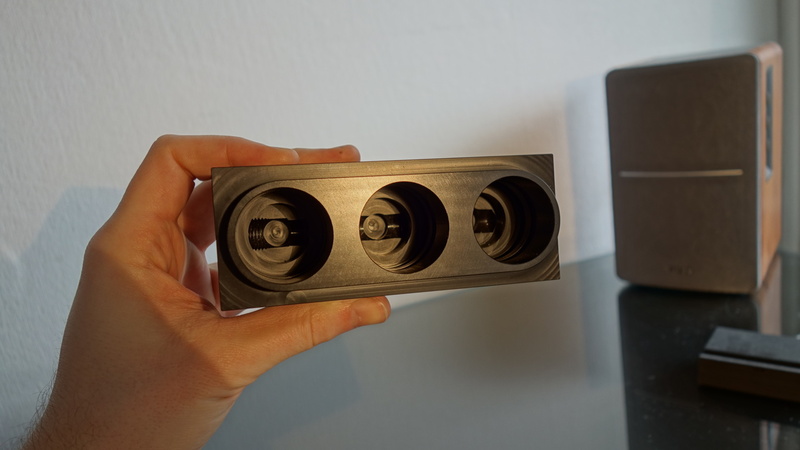 The upper end of the glass tubes will end into a top part made out of aluminium (not manufactured yet). 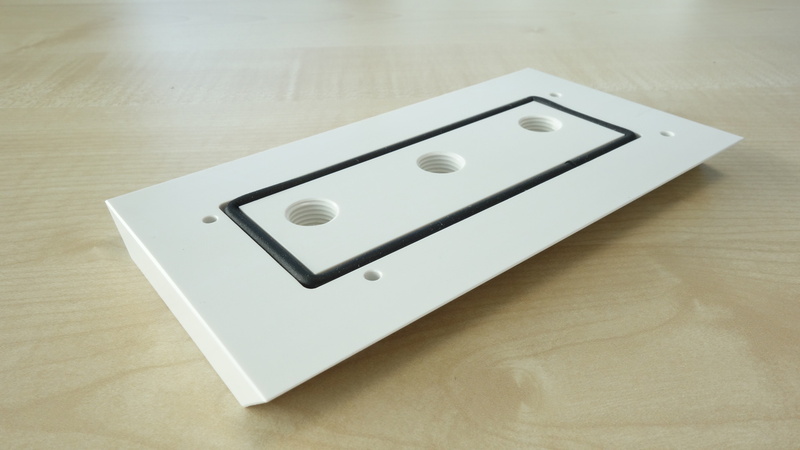 This top part will be screwed onto a top plate with a sealing between both. 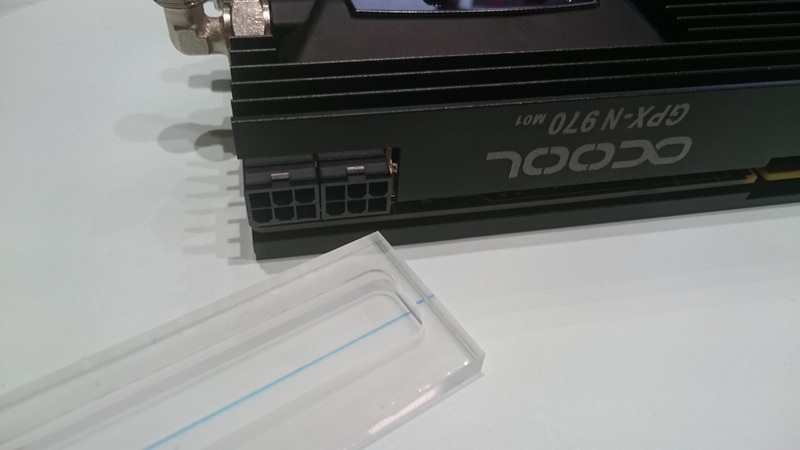 The top plate contains holes for refilling the cooling fluid. I made it out of white PET. 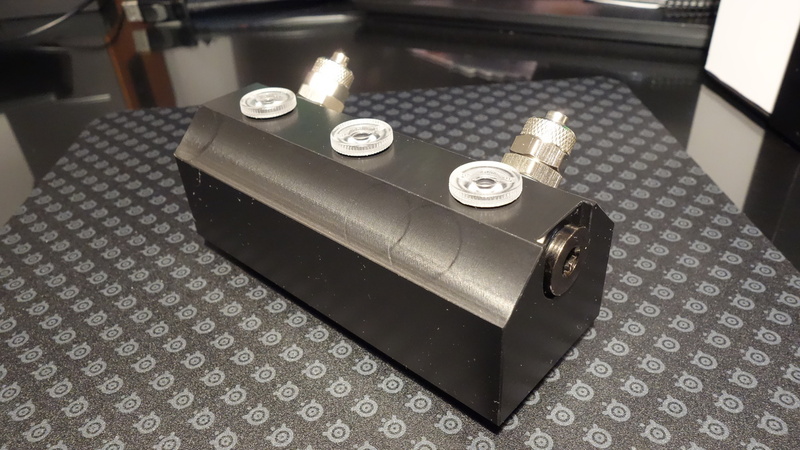 Later it will be masked with a foil to look like black aluminium. 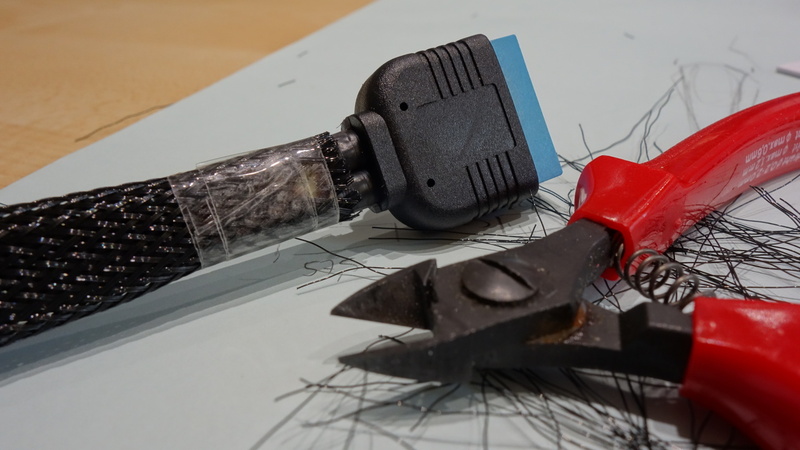 The sealing is a foam rubber sealing cord. 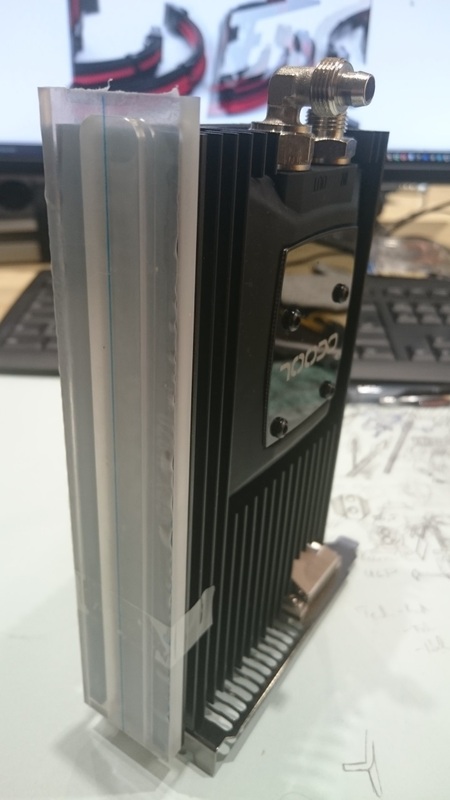 I have finished most of the aluminium profiles used to hold the case together. Not sure if I am going to sand and re-anodize them. 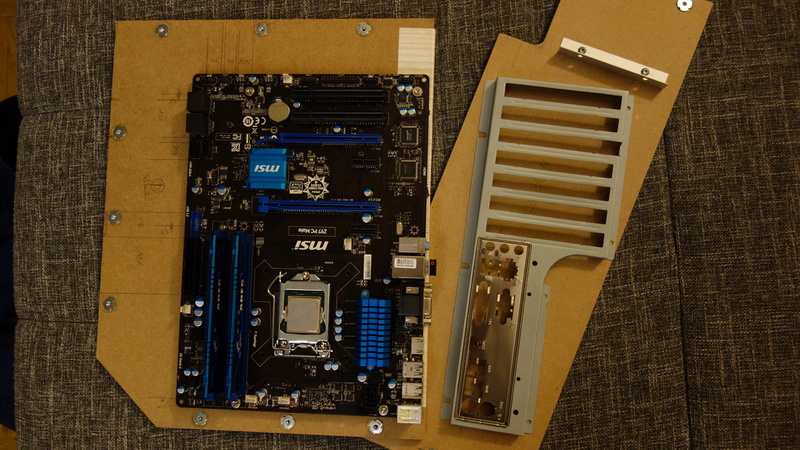 I flattened the mainboard back plate to fit into the MDF-plate. My plans for the GPU are to get a cleaner look by hiding the PCI-E power cables. 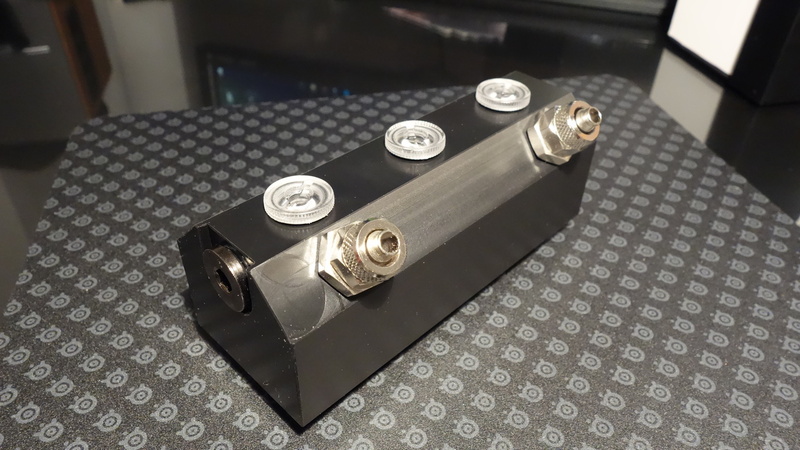 A plate made out of PMMA with a cable duct, covered by a plate made out of aluminium are going to do the job. 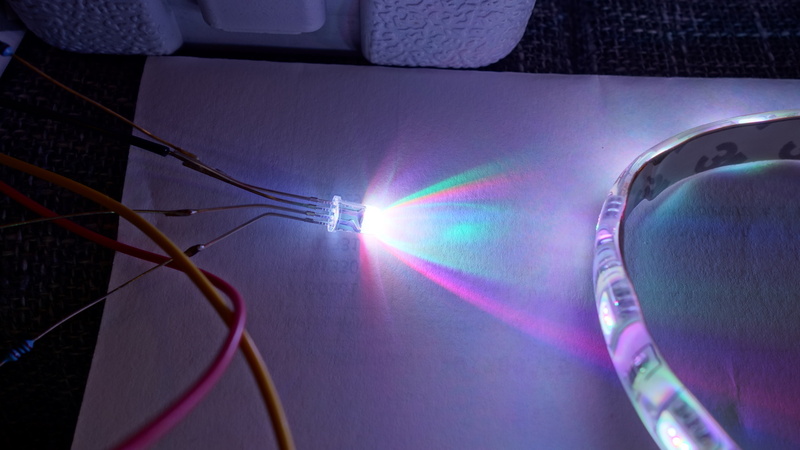 The PMMA plate will be illuminated by two RGB-LEDs.